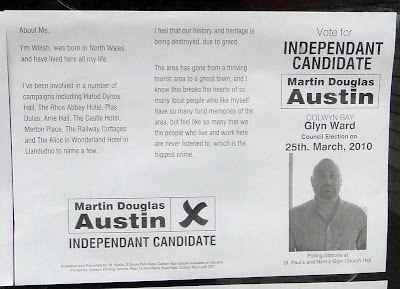 Regardless of the incorrect spelling of 'Independent', I was intrigued to see that he had apparently campaigned on behalf of Hafod Dynos Hall? Of course, it is spelt nothing like that, it is Hafodunos Hall. His campaigning was news to me, I had to admit, as I had spoken to many people/organisations over the past few years in my own efforts to try and save this Grade 1 listed Mansion and Gardens at Llangernyw and I can't recall hearing this gentleman's name mentioned? That's not to say he wasn't involved, of course, but even a Google search brings up absolutely nothing? One must also wonder why he spent the time trying to save Arne Hall, Castle Hotel (presumably the Tudno Castle Hotel?) and the Alice In Wonderland Hotel in Llandudno, whilst at the same time founding a Facebook Group titled 'Llandudno Is A Dump'? None of them have the balls to name and shame corrupt CCBC officers and to try to get to the TRUTH of the scam that is "Regeneration" though... can't see the point of voting in yet another sheep... but there we are - that is for the public to decide on Thursday. Looking at the 'Llandudno is a dump' Facebook page and clicking on Mr Austin's profile, it appears Mr Austin is of the 'Gay persuasion'. One of his 'friends' is the "Ekoo Club" with links to 'Hairy Guys' and 'Chunky Black Men'. Perhaps Mr Austin will have 'enough balls' to name & shame corrupt CCBC officer's after all.